"What are you adding up? We are rejecting the live streamed results and demand evidence from Constituencies." Says Raila Odinga - Bana Kenya News, Real African Network Tubanane. The NASA presidential aspirant Raila Odinga has rubbished the votes streamed on the IEBC computers as fake and demanded the forms 34 as evidence from the IEBC. The NASA tallying center has received several forms that are not in line with whatever the IEBC was streaming. 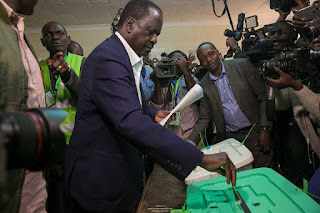 In the press briefing at the late night, Odinga allegedly pointed fingers to the saboteurs of the results streamed saying the meeting that the IEBC had with the Top Jubilee officials have now seemed to bear fruits and condemned the action. "We will not allow fake results to be streamed live. A credible process must have a dashboard showing tallies from various constituencies to add to a sum total. What are they adding and from where? " he said. "We are rejecting the results streamed so far and demand IEBC to change the method by showing the forms as our people have already sent the forms to us and we are looking forward to verification." he added.